The Trans-Plantable Living Room is an outdoor, community-grown, edible ‘living’ room space based on the original Living Stage concept. 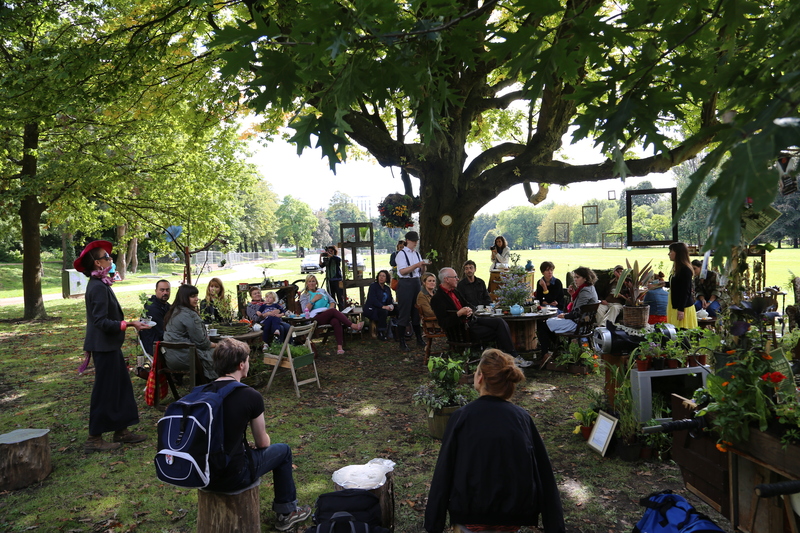 Combining permaculture, story-telling, stage design and performance, the Trans-plantable Living Room brought together artists, gardeners and growers, both internationally and locally to perform in September 2013. The Trans-Plantable Living Room hosted interactive performances by international performance collective Plantable (Lisa Woynarski, Bronwyn Preece and Megan Moe Beitiks) underneath a tree in Bute Park behind the Royal Welsh College of Music and Drama, as part of World Stage Design festival and in London at Central School of Speech and Drama. The ‘living’ room design included household items and furniture (sourced from car yard sales) and adapted to grow plants. The creative process was a collaboration between an international group of artists and community groups. A network of Cardiff based gardeners grew plants for the space, coordinated by Sam Holt of Riverside Community Allotments. 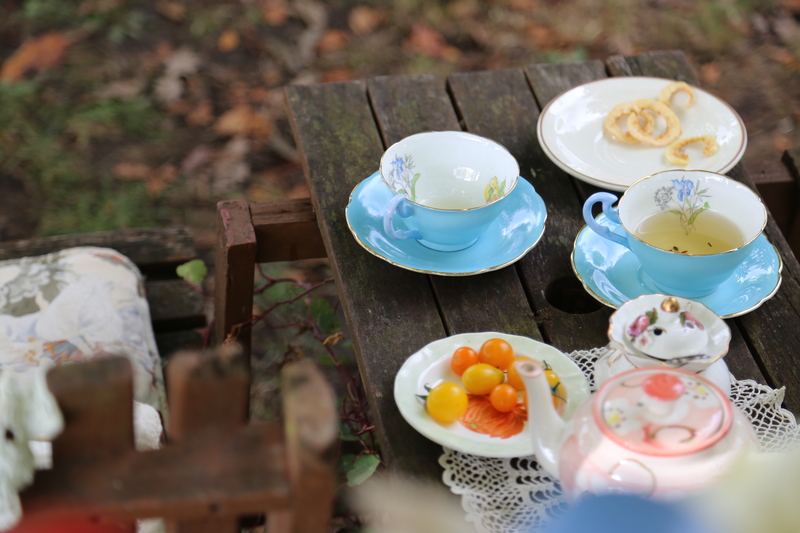 The oral history interviews investigated personal narratives about gardening in Cardiff: why people garden, how gardening practices have changed over time and what role they see local, small-scale food production taking in providing food in today’s fast-changing world. Ideas unearthed in workshops and interviews were woven together by Plantable Performance Research Collective, to create an immersive, interactive performance. Acknowledgements: Becca Clarke of Green City Events, Michele Fitzsimmons of Edible Landscaping, Polly Reichelt and Adamsdown Community Garden, Alistair Rowan and Field Days Organics (Innovate Trust) and Vegalive Aquaponics. Katie Jones of Federation of City Farms and Community Gardens, People’s Collection Wales. Interviewees: Anne Bateman, Anon, Richard Berry, Gordon David Clarke, Sophie Durnan, Edith England, Michele Fitzsimmons, Stephen Garrett, Sam Holt, Jason Horn, Kate Knowles, Yvan Maurel, Lewis Mottrum, Monica Nobriga, Helen Reardon, Mariusz Rogacz, Tim Stevenson, Stephen Watts, Dafyd Williams. A huge thanks to all those who’ve kindly given their time, ideas and resources to the project: Claire Bracegirdle, Frances Smith-Williams, Eva Krasenska, Owen Evans, Ian Garrett and CSPA, Gisela Beer, Manuela Franken, Freya Stanley-Price, Rosie Strickland, Kit Jones, Allan Shepherd, Ariana Jordao, Harry Giles, Emma Williams and everyone at World Stage Design (WSD).